I’m an entrepreneur by trade, running an information broker company here on Planet Earth. So why should Mr. Naveen Jain, earthman from Bellevue, Washington, care about the travails of space exploration? The reasons are as endless as the stars in the skies. First off, ask anyone what they think has been the greatest technological triumph mankind has ever achieved. I bet you nine out of ten people will say “Putting a man on the moon.” And I’m still amazed that remarkable feat of engineering, teamwork, and unbelievable bravery was accomplished in 1969, more than forty years ago! How’s that personal computer working for you? That was developed for the space program. How about that digital watch and cell phone? They were also developed for the space program. Oh, I forgot to mention a few other products that emerged from space exploration: GPS finders, infrared cameras, satellite TV, Teflon, ultrasound, calculators, pace maker batteries, radiation blocking sunglasses, laser surgery… and that’s just the tip of the iceberg. Now is it starting to make sense? I may not be an astronaut or on NASA’s payroll, but I know a good entrepreneurial project when I see one! Thanks to the brave, ultra-smart, and outside of the box thinking pioneers of our space program, our technology has advanced exponentially. Space exploration has given birth to whole new industries, generating a wealth that dwarfs NASA’s budget. We’re talking jobs, a better standard of living, and most importantly, lives being saved. How could an entrepreneur like myself not love the space program? Show me the stars, and I’ll show you the money! Right now we are at the cusp of one of the most exciting chapters in space exploration. So you still think space exploration is still too costly? That it doesn’t pay for itself a thousand times over? Just google the word “space commercialization,” and you might start changing your tune. As you read this article, there are hundreds of entrepreneurs racing to capitalize on the Final Entrepreneurial Frontier–visionaries like Peter Diamandis of the X Prize Foundation, who awarded $10 million to the first “commercial astronauts,” and Richard Branson, who will soon be offering space flights through Virgin Galactic. But don’t just take my word for it. The US government has already moved to license Commercial Astronaut as an official designation. There are currently two official, government-licensed Commercial Astronauts: Mike Melvill and Brian Binnie, the pilots of the X Prize-winning Space Ship One. You won’t be able to get that license at your local DMV, I’ll grant you that…but it will be awarded to those entrepreneurial pioneers who are daring enough to see the commercial potential of space. But there’s more to space exploration and commercialization that vital products and Return on Investment, just like there’s more to Naveen Jain and inome than mere profit reports and information brokering. As John F. Kennedy said, “We will go to the moon not because it is easy, but because it is hard!” Space exploration and commercialization is a very real source of inspiration. What poses a more exciting challenge to a future scientist or businessperson than the exploration of space? Space exploration puts an unquenchable, fiery ambition in people who see outer space as a great adventure. So to get back to the old Return On Investment model (I can can’t help it…I’m a born entrepreneur), space exploration has and continues to give birth to our future scientists and business people…and that means the very best scientists and business people in the world. 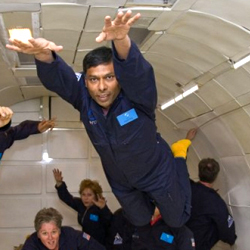 What is Naveen Jain’s Space Explorers? Naveen Jain’s Space Explorers is just my way to keep track of the latest in space news. It’s my sincere hope that Naveen Jain’s Space Explorers will instill in you the same passion for space exploration and commercialization that I have. This site features space-themed news, with links to useful resources. The blog posts cover a wide range of issues, such as the medical effects of space travel to terrestrial preparations for space travel. I also like to comment on astronomy, such as telescopes and the latest discoveries in our solar system. Thanks for visiting Naveen Jain Space Explorers. Please feel free to comment and let me know what you think.